Leading Republican senators are renewing efforts to formally recognize the contested Golan Heights region on Israel's northern border as officially part of the Jewish state, according to U.S. officials who described this effort to the Washington Free Beacon as a "slam dunk." Sens. Ted Cruz (R., Texas), Tom Cotton (R., Ark.) and Rep. Mike Gallagher (R., Wis.) introduced on Wednesday dual resolutions that would make America the first country to recognize Israeli control of the Golan Heights, contested territory captured by Israel from Syria in the 1960s. While the area has sat in legal limbo, U.S. officials say it is critical the American government move to recognize Israel's total control of the territory in light of emerging threats from Iranian forces and terrorist entities situated on the Jewish state's northern border in Syria and Lebanon. Lawmakers undertook a similar effort in the last Congress and officials familiar with the matter told the Free Beacon they see enough momentum on both sides of the aisle to pass a resolution affirming Israel's right to the territory. "This is a slam dunk," one senior GOP congressional staffer involved in advancing the legislation told the Free Beacon. "Everyone supports Israeli sovereignty over the Golan Heights. Republicans and Democrats in Congress say it should happen, all the way up to Democratic leadership in the House. The Prime Minister of Israel called for it just a few weeks ago. Experts tell us it's necessary for the U.S. and Israel because of Iran's presence in Syria." The Golan Heights has emerged as a key piece of territory as militants spill out of Syria and begin to conduct strikes against Israel. In the past months, Iranian-backed forces operating on Israel's northern border have launched a series of terror strikes, which experts view as firm proof Israel should have control of the territory. The Israeli government agrees and is said to have communicated this position to scores of lawmakers and officials in the Trump administration. "Some might decry this as controversial, but the territory is not contested any longer," said Jonathan Schanzer, vice present for research at the Foundation for Defense of Democracies. "Syria is barely a country. And it's an insane notion that a mass murderer like Assad should take on more territory or be responsible for more lives." "The U.S. for years tried to bring Syria and Israel together for a peace plan that hinged on the Golan. Imagine if that succeeded," Schanzer said. "Today, the civil war in Syria would be threatening Israel in ways that are currently unthinkable." The issue of the Golan Heights is certain to top the agenda as the Trump administration conducts shuttle diplomacy aimed at inking an Israeli-Palestinian peace plan. The administration is expected to present its own framework for peace in the coming months, but few details of that plan have yet to emerge publicly. 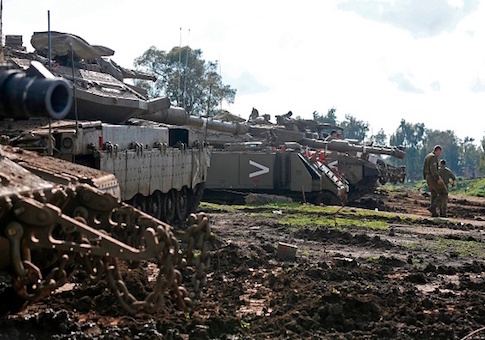 The congressional resolution recognizing Israel's right to control the Golan Heights is likely to send a clear message to the administration that Congress desires this to be a benchmark in any peace plan. The resolution makes clear that the United States believes Israeli control of the Golan Heights is a key national security interest to both countries. "It is in the United States national security interest to ensure that Israel retains control of the Golan Heights [and that] the Syrian regime of Bashar al-Assad faces diplomatic and geopolitical consequences for its killing of civilians, the ethnic cleansing of Arab Sunnis, and the use of weapons of mass destruction," the resolution states. Last year, Cruz and Cotton introduced what sources described as a weaker version of this resolution, prompting U.S. and Israeli leaders to throw their support behind the effort. Leading Democrats in the House endorsed the effort, lending bipartisan credibility that is expected to carry over into this session of Congress. A State Department official would not comment on the legislation, saying it is standard protocol to avoid discussing pending legislation. This entry was posted in National Security and tagged Golan Heights, Israel, Syria. Bookmark the permalink.